I’m crazy excited to finally show you guys what I’ve been putting together in the craft/guest room over the past few weeks. This project started as just getting the craft supplies under control. As you’ll see, the craft area had turned into a hot mess! I started gathering things for the space back in January. 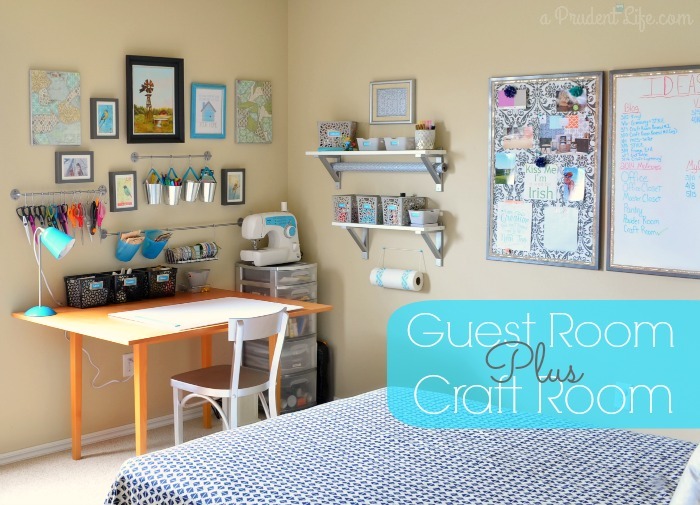 As I thought more about the room, my mind wandered past the craft space into the guest room. Before, “guest room” meant bed shoved into the corner & covered in linens that didn’t match the mood of the craft space. Pretty soon, my scope officially expanded and I was going for a 100% room revamp. I had the IKEA Bygel rails already, but they were a disaster. A couple of them were organized, but most had random things inside. Like my passport cover? How they heck did that get upstairs? Same thing with the plastic drawers in the corner. They seem like they would be good storage, but stuff got shoved in them when we moved (2 years ago!) and while most of the contents were craft related, I never even opened those drawers. I probably shouldn’t admit that one of them was still taped shut from the move! I’m going to have a second post that shows the organization details up close, this post is all about the room design. Unify the craft & guest spaces while giving them the feel of distinct spaces. Here’s what the corner from the before picture looks like now. So much better! In addition to the functional wall rails & shelves, I wanted to add some art to make a gallery wall. The windmill picture in the center was painted by my husband’s granny and I LOVE having something from family to inspire me in this space. I would also like to thank Brother for having turquoise accents on my sewing machine. It wasn’t planned, but it helped make the decision to keep the machine out and easily accessible. It was on the floor before, and I NEVER used it. I’m hoping to change that this year. The home printable came from the SohoSonnet Print Shop on Etsy. I’ve got a closer look at it in an upcoming post on some frame makeovers I did in the space. If you don’t have an IKEA nearby, I found a set of rails and hooks on Amazon! Wacky tip – a piece of yarn and two push pins make an amazing paper towel holder! You use the towels straight from the wall, or easily move the whole roll to your desk for messy projects. When the roll is empty, just use a new piece of yarn! 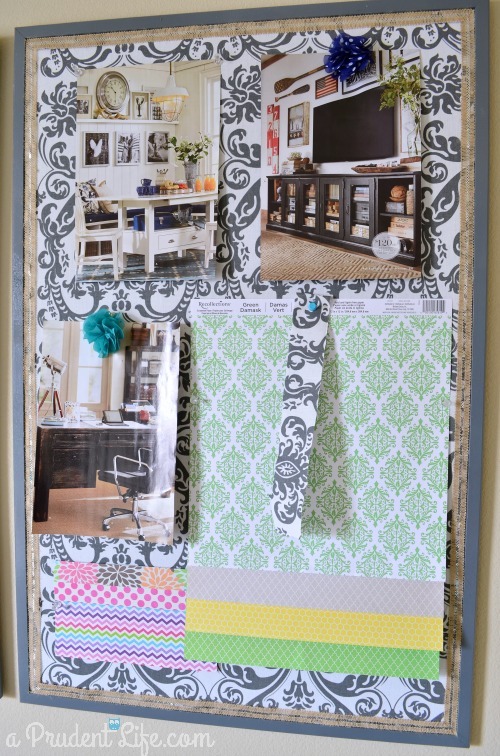 Here’s a closer look of one of the inspiration boards in use! On the other side of the window, I have a reading nook. 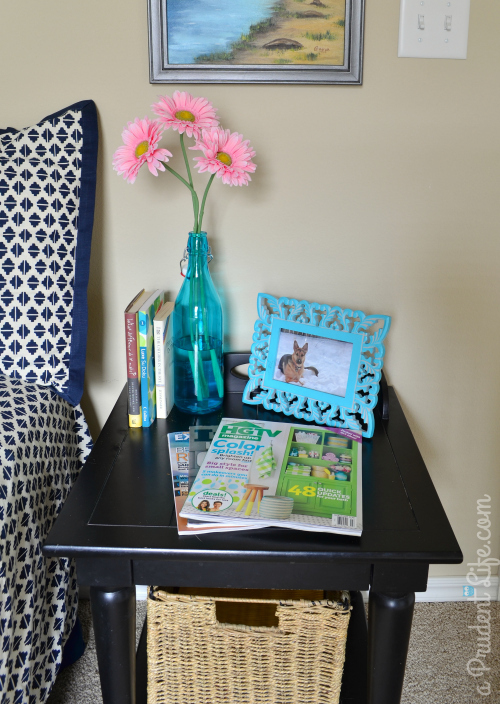 It’s a great place to hang out and flag inspiring products when new catalogs come out! The navy & cream basket under the window is the trash bin! I needed a something larger and prettier than my white plastic bin. I also needed something to pull the navy from the bedding to that side of the room. Win-win! We’ve had this IKEA bookshelf and chair about 13 years! 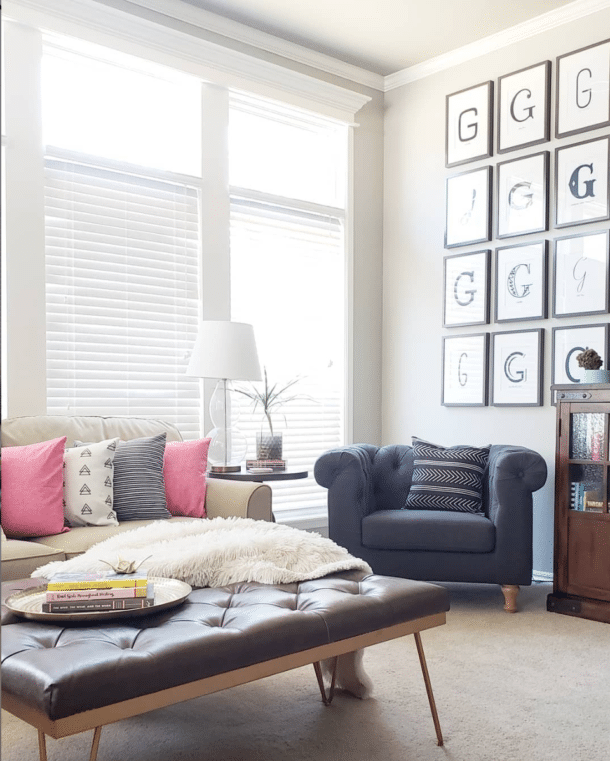 The chair is perfect for this space because it isn’t as large as a traditional armchair. 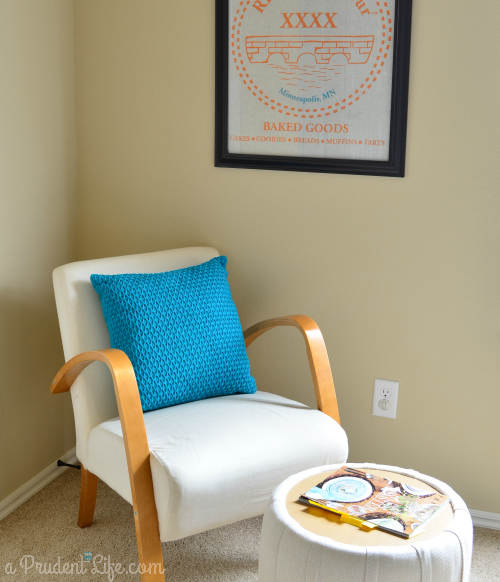 The art above the chair is actually a dish towel! Can you believe it? I found it in a package with a solid turquoise dish towel for $5 total. I attached it to foam core with spray adhesive. I already had the frame making this a REALLY cheap project. I was born in Minneapolis, so it is great to pull that part of my history into my space. Next is the view you would see from the chair. 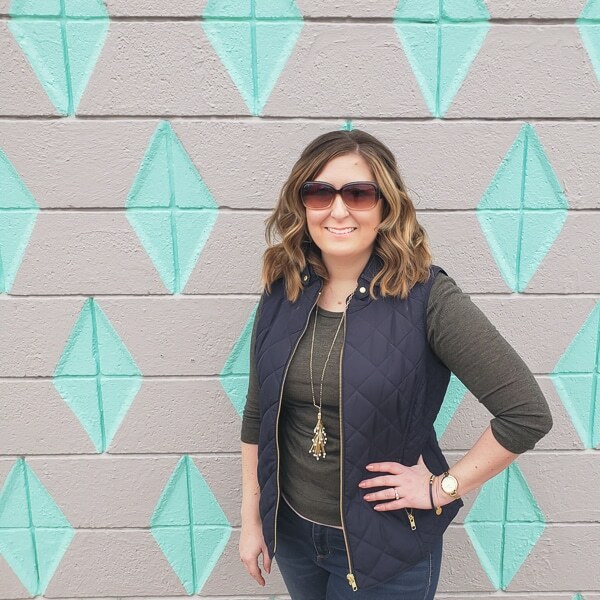 I’m in love with the Nate Berkus bedding we found at Target! AND it was on clearance for $40 – perfect for my budget. We’ve never had a headboard for this room, and it wasn’t in the budget to even build our own right now. THEN I found a ton of turquoise round placements for $1.12 each (Target again). $10 later, I have a faux headboard until we upgrade! The paintings on the bed wall are also by Granny. I updated the frames to coordinate with the room. The cute birdy lamp details are here. The table under the birdy lamp was also customized. More details on that next week! I added a few books & magazines so guests can take some time to relax. Or maybe I will never leave this room! While $250 is not an insignificant amount of money, I’m pretty happy that I was essentially able to create two very functional spaces in my home for that amount. I purchased the items over three months, and was able to keep costs down by taking my time waiting for the right deal. Finding stylish budget friendly bedding was one of the hardest challenges. I couldn’t believe I found the 50% off Nate Berkus bedding in the color I wanted! This is the first time I’ve planned out an entire room at once, and it was a blast! Figuring out how to balance the turquoise, navy, & gray/silver throughout the room was actually fun for me. I pretty much want to hang out upstairs all the time now. I can’t wait to show you the organizational details in another post. I’ve done a few craft projects in the room already, and it’s great to know where everything is. And because the space is pretty, I put everything up before leaving the room! Ready for more? 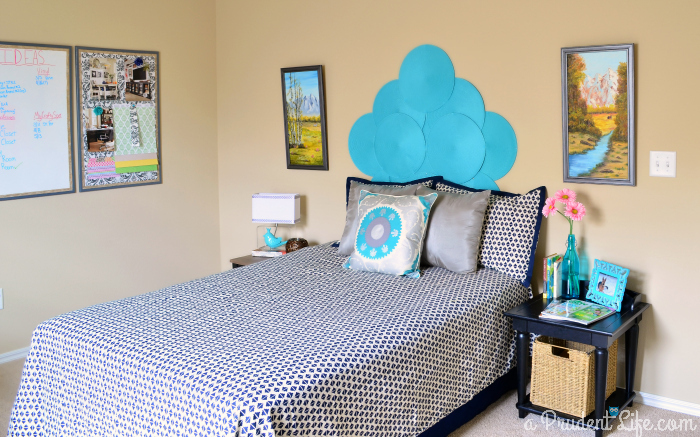 Check out part #2 of the room reveal! Don’t miss any of the craft room series! 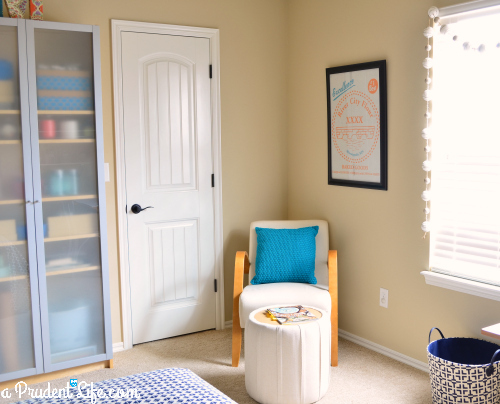 It looks great, I love how you were able to mesh the two purposes together and use the room for guests and crafts! I love this series! 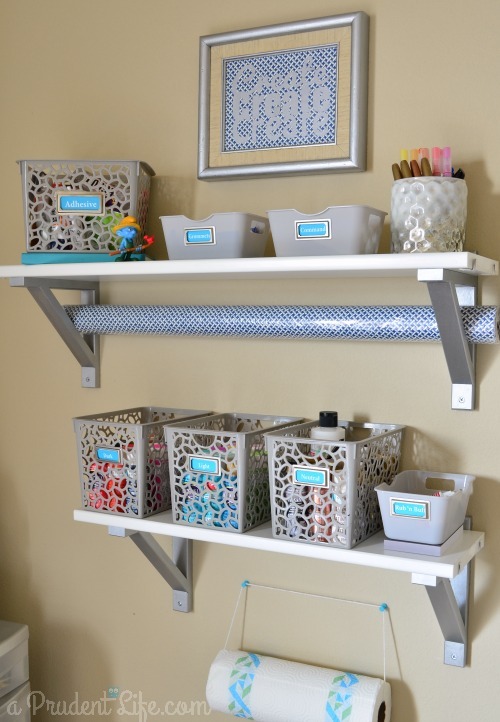 Thank you for showing off your organizing and design skills. 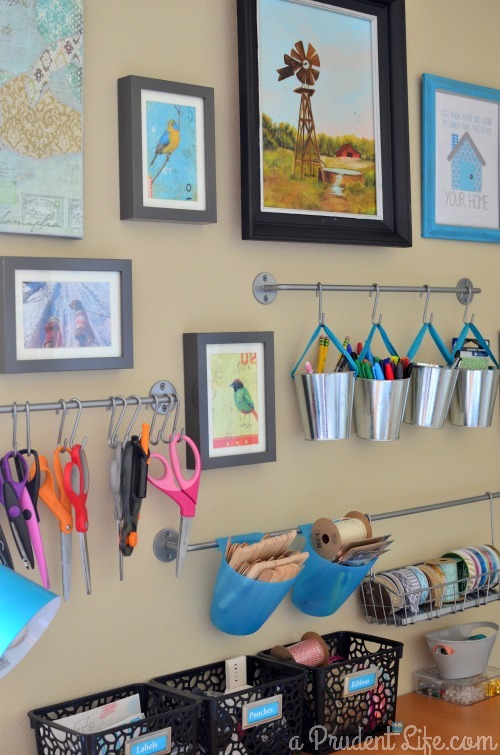 I hope to share my own craft room/home office organization project, but I am not planning on making it look nearly as beautiful as yours! Thank you Eliza! I’m sure your room will be beautiful! 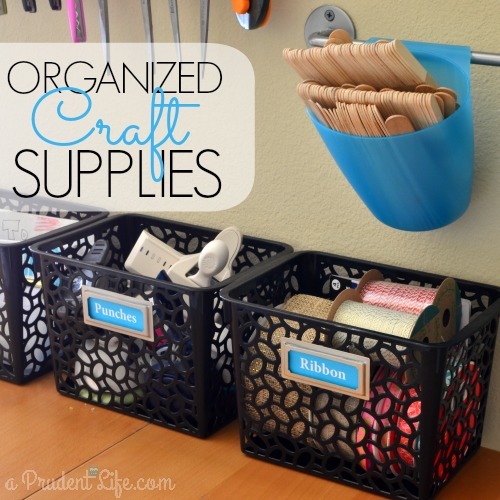 I am in LOVE with the way you organized your craft area! Genius and so very pretty, too! You’re so sweet Mary! Thank you! Melissa, you’re so talented! I just love this space! I have my office in our guest room and while it might be a bit smaller than you space, you’ve given me some inspiration. Ah, thanks Kim! Taking advantage of the wall space really helped me maximize what I could keep “out”. Glad it was inspiring to you! Can you tell me what you used o hold the scissors on the towel rack? Also, where can you purchase these items? Hi Gayle, it’s an IKEA Bygel rail and hook system. If you don’t have an IKEA around, you can ask for S hooks at the hardware store. 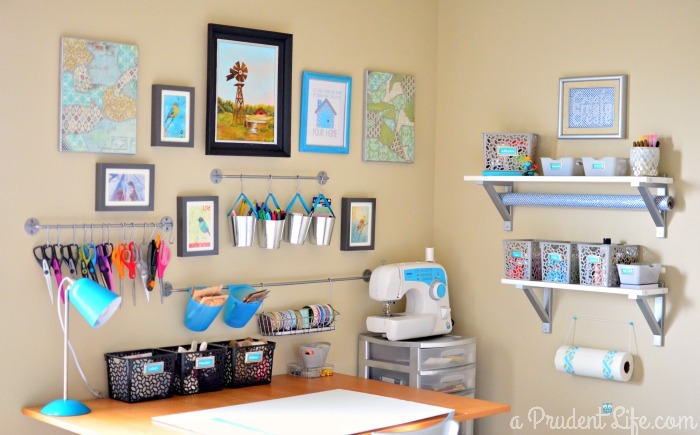 I am so impressed by your craft space! Can you tell me how long about you purchased the bins from Target? I really like the design and also how you can see what’s in them. Also, where did you get the label holders on the baskets? I love to label things! 🙂 Thanks for the paper towel tip too!! I’ve seen those tin containers at Target within the past couple months. They go away, then come back, so just keep checking! The metal label holders are Martha Stewart from Staples. 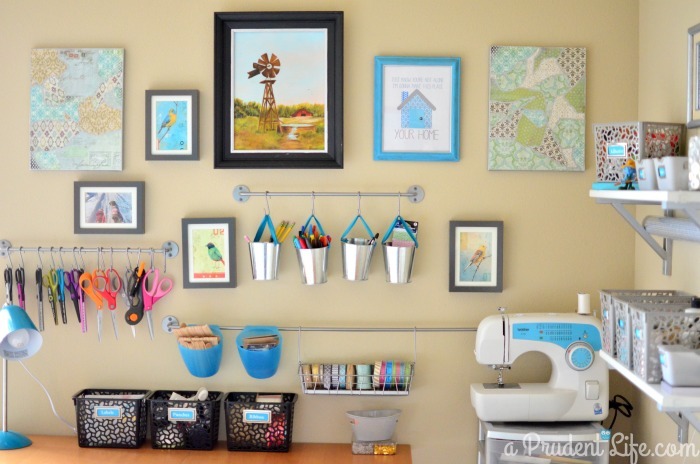 Hi, just found your adorable craft room via Pinterest. Can you tell me where you found the gold bookplates that you used for labels on all the little bins? Thank you. 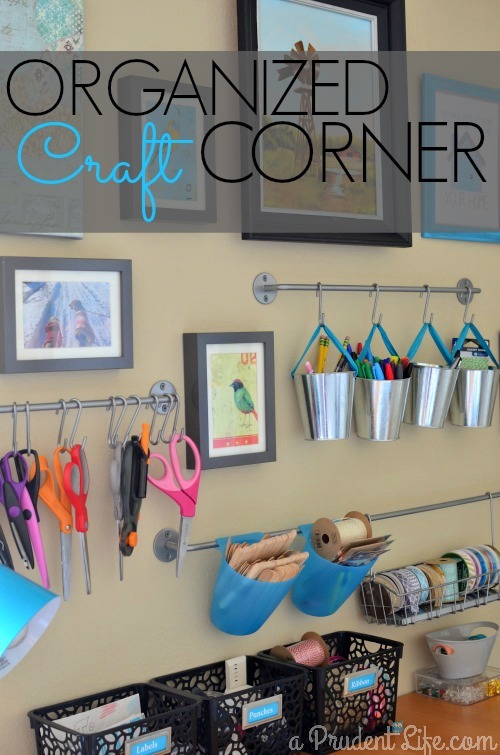 Can’t wait to have a craft room. They are the Avery Martha Stewart line, I’ve heard rumors of them being discontinued, which would be tragic! That looks really awesome. 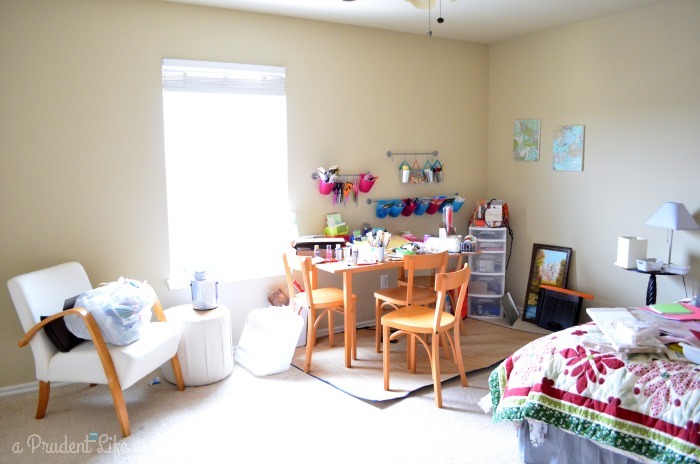 I’m moving pretty soon and the house I’m going into has a perfect room for crafts/bedroom if I wanted to. I fell in love with this design. Where did you get the rods that you hung the scissors and pails from? It’s a Bygel rail from IKEA, and then the buckets are from the Dollar section at Target, they still have them a few times a year. Congrats on your new home! lol if I had read the comments I would have saw the answer the first time around. Great design…Did you get the desk from IKEA also? Ha! No problem! Yeah, it’s a dining room table we had from out first house so we reused it at a craft table. IKEA does have super affordable desk/table legs and tops you can put together in different combos to make the perfect size craft table, so I’d check those out. I love this! I am pinning this! I have to organize my combo office/craft room/guest room. 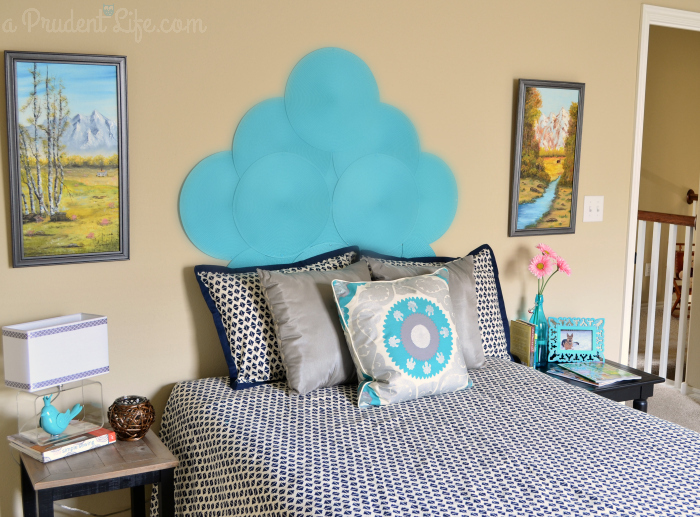 The only problem is that the room was once the baby room for my twins, which my husband adorably stenciled in a Pooh bear theme. My kids don’t want to part with the Pooh bear theme (and my husband did do a beautiful job), so I have to work in a Pooh bear room! I might just hang something behind the desk so I don’t have to stare at Pooh Bear! We have a very sentimental family! Ah, so sweet that your husband painted it and that the kids are still attached. That would be really hard to let go. It would be fun to come up with some kind of art or storage on hinges to hang over it so Pooh Bear was covered up most of the time, but easily accessible for reminiscing!